Vendéen Bichonné, a pasteurized cow's milk cheese from Brittany whose name translates as "the pampered cheese from the Vendée region." 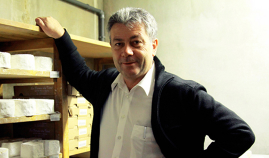 The person doing the pampering is Pascal Beillevaire, an affineur (cheese ager) who buys 6-week-old wheels from a cooperative near Nantes and transports them to his underground cave, a former railroad tunnel, in the Auvergne. The wheels stay in this humid environment for two months, during which time they are turned and brushed occasionally to clean them up. The wheels, which weigh 10 to 12 pounds, arrive in the Bay Area with a healthy cloak of gray and white molds. 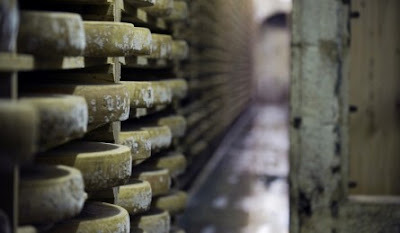 Before Beillevaire buys and matures the wheels, the cheese is known as Halbran, a name that few French people would even recognize. It is primarily a local cheese - at least until Beillevaire matures it, rechristens it, puts it in his retail shops in Paris and ships it overseas. The Beillevaire business is an active part of the community of Machecoul and the surrounding area and is deeply connected to Pascal’s roots. In fact, the dairy is located only 6km from Pascal’s family farm “La Vacheresse” where Pascal was born. Pascal began working on his parents’ dairy farm as a young boy. When selling family milk and cream at local market places, he quickly discovered a passion for the trade and for the products themselves. From the age of 17, Pascal has worked tirelessly to develop what is now a broad offering of dairy products under the Pascal Beillevaire brand including fresh milk, cream, butter, yogurt, crème fraîche, mousses and cheese. All of these products are made using raw milk that is brought to the dairy twice each day from local farms all within 10km of the dairy. When the milk arrives at the dairy, it is still warm from the cow at the perfect temperature to begin production. 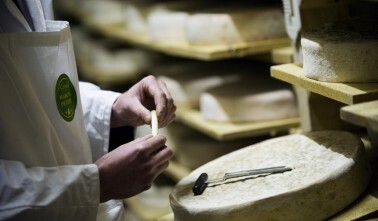 Following the success with his own dairy products, Pascal decided to expand his operation to include affinage – the art of aging cheeses. His approach is entirely consistent with his roots as he works closely with small farmhouse or ‘fermier’ producers who send their young cheeses to him in order to be carefully aged and sold both within Europe and now to their U.S. customers. In choosing to pursue these farmhouse cheeses, he is actively contributing to the maintenance of an important rural artisan trade and helping to preserve ancestral know-how. Today, 200 producers send more than 400 cheeses to the ripening caves of Pascal Bellevaire.